Leather backpack. Brown and green rucksack. One Strap Backpack. Woman rucksack leather. Small leather backpack. Brown green shoulder bag. 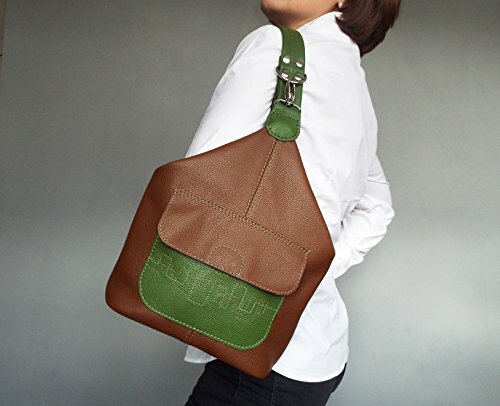 This cute and original small leather backpack / rucksack / shoulder bag is made of full grain genuine leather in chocolate brown and green colors. It features one front pocket with decorative stitches and one large lined compartment. The bag has adjustable handle and closes through ykk zipper. It is lined with durable brown fabric. Size of the bag full height - 11.5" / 30 cm height / measured ti the fold/ 9" / 23cm width - 12" / 31 cm depth - 4.5" /11 cm handle - up to 35"/ 90 cm The bag will be sent by registered, priority mail.